Why hike to Harden Lake? Because it's there, perhaps? This is a tricky question. If you're a scenery enthusiast, you'll rightly conclude that Harden Lake doesn't measure up to Yosemite's high standards for lake visuals. It's a small lake without any impressive mountains surrounding it - no matter which way you look, all you'll see at the horizon is trees. There is a small meadow at the near side of the lake, so you can be compensated with wildflowers if your timing is right. Scenery Bonus: If you continue half a mile or so past the lake, you'll descend a few switchbacks and then reach a clearing where you can catch some tantalizing glimpses of the Grand Canyon of the Tuolumne. The opening here looks mainly to the northwest, the tail end of the canyon; views of the jagged peaks to the northeast are mostly blocked by trees. Best Time to Visit: In June and/or early July, when the wildflowers are blooming. Crowd Factor: Generally light, but not comprehensively so. Trails this easy usually have at least some traffic on them. Difficulty: An easy trail, but too long to be a complete pushover: a 4 out of 10. The trail is wide and smooth - understandably so, since it's an old road. It descends gently but steadily for the first two miles (3.2 km). From there it's a series of modest ups and downs the last mile to the lake; the right fork (see the trail notes below) probably has the least overall elevation change. Parking: Parking for about 20 cars at the White Wolf Lodge, which is more or less where the trailhead is (see the trail notes below). Nearest Bathrooms: There are public bathrooms with plumbing at the White Wolf Campground, which is adjacent to the trailhead parking lot. Nearest Snacks: The White Wolf Lodge has a small store (so small that only the proprietor can fit inside) selling an extremely limited variety of snacks - chips and ice cream, mostly. When you get down to it, though, isn't that enough? Getting There: The trailhead is at the White Wolf Lodge, just off Tioga Road. From Yosemite Valley, take highway 120 for 10 miles (16 km) to its junction with the Tioga Road, then take Tioga Road 15 miles (24 km) east to the White Wolf turnout. From the Tioga Pass entrance, take Tioga Road 30 miles (48 km) west to the same turnout. From the White Wolf turnoff, it's a mile (1.6 km) to the White Wolf Lodge itself. Trailhead parking is beside and across the road from the lodge. The Google Street View car hasn't been down White Wolf Road yet, so in lieu of a trailhead/parking panorama, here's one of the White Wolf Road turnoff. Trail Notes: At the trailhead parking lot, you'll find a trailhead with a sign indicating that Harden Lake is 5.7 miles (9.2 km) away. This may be true, but it's not the optimal route. It is, in fact, twice as long as the normal route. Unless you want double the workout, don't take this trail. Instead, start hiking down the White Wolf Lodge Road, which you just drove in on. Just past the White Wolf Campground, you'll probably find a sign indicating the road is closed. Shortly after that, you may find a gate across the road. Ignore these obstacles; you're in an unusually right-thinking pocket of the world where rules are for other people less special and remarkable than you are (specifically, they're for people in cars). Two miles into the hike, a trail will depart the road to the right. A sign here indicates that Harden Lake is 0.9 miles (1.4 km) ahead on the trail. This is true, but taking this trail is optional; it rejoins the road just over half a mile ahead. Just before you reach the lake, the trail forks again. The left fork goes to Hetch Hetchy Reservoir; the right fork takes you to Harden Lake, which is in fact only a hundred meters or so away. If you continue past the lake, after half a mile or so you'll descend some switchbacks and emerge in a clearing where you can get a view of the last section of the Grand Canyon of the Tuolumne. 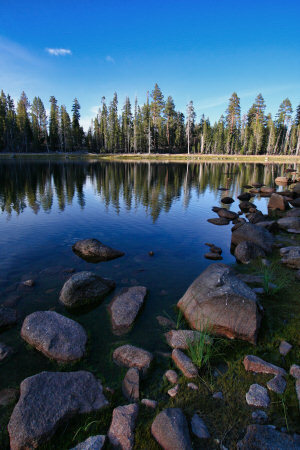 Hazards: Anywhere in Yosemite you find a body of water, you're likely to find mosquitoes soon after.